A science blog for everyone… and a perpetual work in progress. Camping, cooking, and other miscellany. The mission of The Bioconjugate is to explore methods of increasing scientific literacy in the non-scientist public as a means of breaking down the sciences esoteric and distant connotations. Run by University of Wisconsin - Madison PhD student, Andrew Lynch, the blog is dedicated to communicating important advances and topics in the biosciences and also serves as an outlet for his interests in the sciences. Research Rundown: Mouse study to find link between MT-1 protein and Alzheimer's-associated factors. Climate change, the Keeling Curve, and why you need to be your own scientist. We’ll get to this in a little bit. Global climate change (more specifically called global warming). Words so often uttered that, to the lay-person, they have almost lost their meaning. It’s unfortunate that words of such importance should fall victim to semantic satiation in a time wherein important decisions are being made (in an almost… executive fashion you could say) that will negatively impact efforts to reverse global climate change’s effects and prevent its increasingly inevitable outcomes. So what I want to do is try to brush off some of the ambivalence and malaise associated with global climate change (GCC) as a result of its platitudinous usage. Despite being a student of biochemistry and molecular and cell biology (the tiny biosciences), I believe that environmental science, more so than any other, should be understood by every single person. As humans, we are dependent on the world around us. We are not self-sustaining, perpetually operating automatons. We require the nutrients from the food and drink that we consume. We require oxygen from the air that we breathe. We require shelter and clothing to keep warm, dry, and healthy. Could we build homes without lumber? Could we clothe ourselves without fibers from cotton? We are literally products of our environment. Damage to the environment around us only damages ourselves. And so far, as a species and historically speaking, we have been doing a lousy job of protecting the environment in which we live. Educating ourselves in and becoming observant of climate science will aid in protecting ourselves from the consequences of further damage to our environment. GCC is a multifactorial, important, and dangerous reality. The sooner we can all familiarize ourselves with the problem, the sooner we can find a common solution. Imagine it’s a sunny, late-winter day. The outdoor temperature is still quite cool, but your car has been sitting in direct sunlight all day. You get in your car and find that it’s exceptionally warm. That’s the greenhouse effect. Earth’s atmosphere is primarily made up of the gases Nitrogen (~78%), Oxygen (~21%), and Argon (~0.9%). The remaining 0.1% is composed of a combination of the gases CO2, water vapor, methane (CH4), nitrous oxide (N2O), ozone (O3), and various chemicals called chlorofluorocarbons [KLOR-o-FLOR-o-CAR-bun] (CFCs). These gases are categorized as ‘greenhouse gases’ due to the warming effect they have on Earth. In the atmosphere, these gases act quite like the windshield of a car. Light from the sun passes through the layer of greenhouse gases on the way to Earth and warms up the surface, water, and the lower levels of the atmosphere. In this way, the light from the sun is converted from light energy to heat (infrared energy). Greenhouse gases act as a barrier against infrared energy, thus trapping the heat in. This mechanism of trapping heat is one factor in why life has been able to thrive on Earth, but the increasing concentration of heat-reflecting greenhouse gases in the atmosphere is giving rise to a dangerous level of global heat retention among other unhealthy outcomes. Take another look at the graph above. This is an extension of the Keeling Curve (horizontal=time, vertical=atmospheric CO2 concentration) which includes data taken from ancient air bubbles frozen in time within ice cores that allow us to extrapolate past atmospheric gas levels. The original (below) has been kept since 1958 and was started at Hawaii’s Mauna Loa Observatory by Charles David Keeling of the Scripps Institution of Oceanography in San Diego. Combining the two records, we have a record of atmospheric carbon levels that goes back 800,000 years, revealing normal and… abnormal global trends. One can clearly see the effect that human industrialization has had on our Earth’s atmosphere. Keeling used a nondispersive infrared sensor, which uses light to detect specific gases, to measure atmospheric levels of CO2. What he originally found was that atmospheric carbon levels were increasing steadily at just over 1 ppm per year. Imagine a bowl filled with 1 million M&Ms. If one of these M&Ms was blue and the other 999,999 were red, the concentration of blue M&Ms in the bowl is one part per million. 1 ppm. This doesn’t seem like much, but given enough time and the increasing demand for fossil fuels as the world’s populations develop further, this rate of carbon deposition in Earth’s atmosphere will spell disaster for us resident Earthlings. Already the current rate of change is dancing around 2 ppm/year (NOAA). Estimates of ice-age or otherwise preindustrial atmospheric carbon levels range from 250-290 ppm1. At the time of Keeling’s first measurements, it was at about 310 ppm2. As I am writing this article, the current measurement is 410.14 ppm. Though it helps, you don’t really need the graph below to see a trend. If these aren’t convincing data, I don’t know what is. You may be wondering: why do the CO2 levels oscillate every year? The oscillations coincide with the northern hemisphere’s seasonal changes. Because the northern hemisphere holds the vast majority of the Earth’s landmass, it also holds the majority of the Earth’s vegetation. The oscillations are a manifestation of vegetative carbon consumption cycles. If only there were some way we could reduce carbon emission and deforestation and just leave Earth’s wisest biological kingdom to stabilize the atmosphere. There is a great and harrowing simulation that shows the emission of fossil fuels between 2011-2012 using open-source economic data here. out is not constant. Its variable energy output is subject to change and this change does affect climate here on Earth. 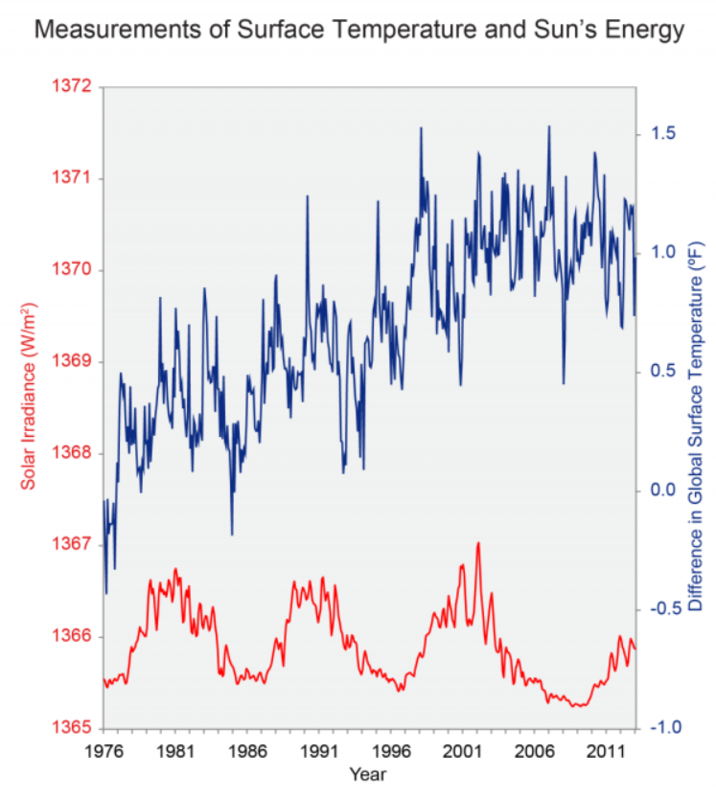 The data show that the sun undergoes 11 year cycles of oscillating energy output that can affect Earth’s surface temperature, but there is no evidence of an overall increase in solar energy output across cycles, meaning that the Earth’s warming trend is not attributable to this phenomenon (right). The Basics: What Has Been Affected & Implications? Alright so atmospheric greenhouse gas concentrations are rising and us humans are at fault, but how does that actually translate into something as sinister as global climate change? Here is where we encounter the various reasons why global climate change and global warming are two separate, albeit interconnected concepts. Let’s start with the most ubiquitous association: the link between increasing anthropogenic greenhouse gas concentration and global warming. What is really causing the warming effect? The sun emits a wide range of wavelengths of electromagnetic radiation, from x-rays (high energy) to radio waves (low energy) and everything in between. The vast majority of this emitted energy is in the visible and near-visible wavelengths of the electromagnetic spectrum. As I mentioned before, when visible and ultraviolet light is absorbed in the atmosphere on the Earth’s surface, it emits infrared (heat) energy that is trapped the greenhouse gases in our atmosphere, the result being a warm Earth. This phenomenon allows for a thriving Earth as opposed to one that is cold and desolate. However, the increasing concentration of greenhouse gases, namely carbon dioxide, gives rise to the increasing trend of global average and anomalous temperatures. The most obvious effect of these rising temperatures is the accelerating melting of the polar ice caps. According to NASA, global sea ice is melting away at a rate of 13.3% per decade. The amount of land-bound ice is disappearing quickly as well. While not many humans reside (relative to other areas of the world), there is a preponderance of animal life that call areas of land and sea ice home. Most familiarly, polar bear populations have been damaged by the reduction in ice in the Arctic. Being that polar bears are an important keystone species, a designation given to species that play an important role in regulating ecosystems, the melting of their habitats holds considerable potential for ecological damage. In addition to damaging ecosystems, the melting of land-bound ice poses another problem: Rising sea levels. While the melting of sea ice does not contribute to rising sea levels as it is already displacing water as it floats (picture ice melting in a glass of ice water), melting land-bound ice has been contributing to rising sea levels for some time. Researchers have found that the sea level has risen approximately 200mm (8 inches) over the past 130 years, an average rate of 1.5 mm per year, and is currently rising at a rate of 3.4mm per year (NASA). Models of global sea level changes indicate that by the end of the 21<sup>st</sup> century, sea levels will rise between 0.2 and 2.0 meters, or about 8 inches to 6.5 feet. This is admittedly a broad range, but the result at either end of the scale is drastically increasing flood frequencies in the heavily populated coastal regions around the globe. Heat sinks are objects that are more capable of absorbing heat energy than other objects in their environment. Common elements of computers, heat sinks protect the fragile machinery within a computer from the heat it produces by absorbing and dissipating it safely. The oceans that cover about 70% of Earth’s surface act as a global heat sink, absorbing some of the heat energy in the atmosphere. In the years since industrialization, the surface temperature of the Earth’s oceans has increased drastically – as much as 4oF in some local areas. This means that these ocean surface temperatures, in many areas, are increasing even more quickly than land surface temperatures. But why should we care if the ocean is slightly warmer? Does it really make a difference? Short answer – Yup. In reality, these temperature increases are not just “small differences”. The amount of energy that is required to warm the unfathomably large volume of water at the ocean’s surfaces is astronomical, and while a century may seem like a long time, the fact that these changes are caused by anthropogenic factors is foreboding. We have done a lot of damage in a short amount of time. Only a few months ago it was reported that the large spans of the Great Barrier Reef are now dead, with the rest dying rapidly. marine invertebrates that sequester calcium carbonate (CaCO3) to excrete hard exoskeletons on which colorful species of algae grow. These algae (zooxanthellae) form symbiotic relationships with the coral as the coral give them a place to grow and, in return, they provide the coral with energy to grow. Zooxanthellae grow under specific temperature conditions and, when stressed, will abandon the coral, cutting off the corals energy source. When this happens the coral take on a sickly pale color and often die. Given that the Great Barrier Reef is a UNESCO World Heritage Site as well as a hotspot of biodiversity contributing to overall marine health, its death is a reality that nobody should be comfortable with. The temperature of the ocean is not all that is affected by global climate change. We have also observed dramatic shifts in oceanic pH (acidity) attributable to the increase of atmospheric carbon dioxide. According to the EPA, the ocean absorbs about 1/3 of human-produced carbon dioxide. Not only is the ocean a heat sink, but it’s a carbon sink as well. Acidity is a measurement of the concentration of free hydrogen (H+) molecules in a solution. Acidity is often measured in terms of pH, a mathematic formulation that allows for acidity to be easily represented as a number between 0 and 14, 0 being very acidic and 14 being just the opposite. But how does carbon dioxide, something we think of as typically being an atmospheric gas, contribute to ocean acidification? Atmospheric, or gaseous, carbon dioxide readily diffuses into water, dissolving just as salt or sugar. This dissolved or aqueous carbon dioxide reacts with the water in the ocean, to form carbonic acid (H2CO3 by stripping away hydrogen molecules from the H2O. Carbonic acid can then release these hydrogen molecules, increasing overall H+ concentration and forming carbonate (CO3–). Diagram depicting the process by which CO2 diffuses into the ocean and reacts with water to form carbonic acid. 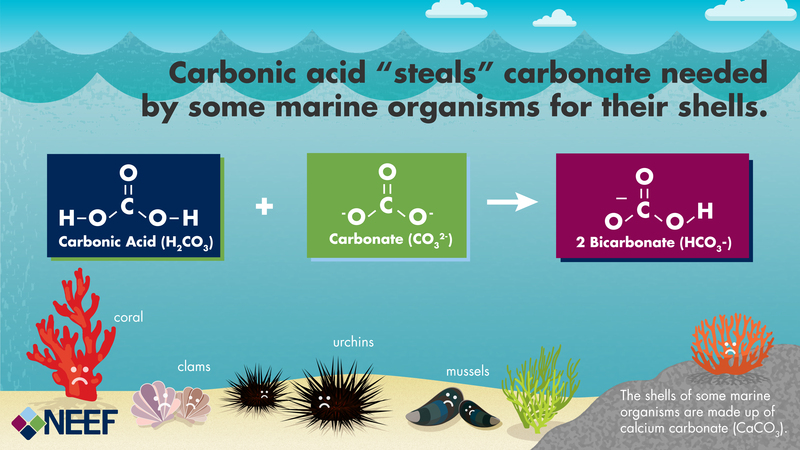 Calcium carbonate (CaCO3) is important in the development of a large number of marine organisms. It’s used in the production of coral exoskeletons, sea urchin teeth, shells used by many marine invertebrates such as clams and mussels, and internal structures of some cephalopods (octopi, squid, and cuttlefish). Carbonate deficient environments that ocean acidification is capable of producing hinders the developement of these organisms. The potential for global climate change impacting human health is substantial and complex. Human health outcomes are affected by, and often results of, our environment. As our Earth’s climate changes, our ability to adapt to the effects of these changes will dictate the fate of our wellbeing. As global atmospheric temperature increases, so too does the duration and frequency of intense heat waves. Extreme heat can be deadly, especially for older and younger populations who are less able to efficiently regulate body temperature and are thus more susceptible to the negative respiratory and cardiovascular effects it can have on their health. Additionally, people in lower socioeconomic status populations may not have access to air conditioning and consistent and reliable shelter from the elements. Also increasing frequency of dangerous wildfires. Do I have to say any more about that? Furthermore, increasing air temperature may be contributing to increasing incidence of crop failure5. Many of us are fortunate enough to be able to buy grocers at supermarkets that source their tomatoes (for example) from multiple sources. If one region is having trouble growing a crop, a supermarket might get their tomatoes from a different distributor, thus we never have to go without our salsa or homemade pasta sauce. However, not all people have access to the incredible variety a supermarket provides. Many people rely on crops produced from their own farms or other local providers. If global climate change is left unbridled, and crop failure incidence increases, those who do not have access to imported foods may suffer food shortages as a result. I think we can all agree that air is important. Characteristics of global climate change, like changing weather patterns and warming temperatures, have the potential to increase the formation of ground-level ozone, an atmospheric gas that can have cause respiratory complications, like inflammation and asthma, in high concentrations. The increase in heat waves and dry spells are not the only weather-related impacts of global climate change. It has also given rise to events of extreme levels of precipitation, causing flooding which often results in property damage, injury, and death. Additionally, the increasing frequency of extreme storm events is linked to global climate change and has the potential to be extremely harmful. While storms certainly can be harmful, oftentimes the greatest impacts on human health are due to the conditions the storms leave behind. Bridges and roads can be washed out, limiting access to medical services and electrical power can be lost and homes damaged, limiting the effectiveness of their shelter. The geographical distribution of disease is very much a function of local climate. Many pathogens that cause disease only thrive under certain environmental conditions. This is why people that live in Scandinavian countries do not typically have to worry about contracting tropical diseases like Chagas Disease, as the insect that carries the disease-causing parasite cannot survive the cold environment. But as local climates shift and temperatures increase, the environments that previously would not have been suitable for harmful pathogens suddenly become quite cozy. Suddenly, water that was otherwise relatively safe to drink because it was too cold to harbor Giardia, becomes a breeding ground for the harmful microbes that cause severe diarrhea. Suddenly, environments that were too cold to host certain insect vectors (carriers of disease-causing pathogens), allow for their migration, introducing a cavalcade of new diseases never before experienced by the region. Look up specific health impacts by state. (U.S. only). The results found and the data collected in empirically conducted science are truths of the reality in which we live. Reality does not have an agenda, nor does it play favorites. Reality applies to all things equally. As residents of reality, we do ourselves and our future a disservice by ignoring or denying scientific findings beyond the threshold over which it becomes unreasonable, whether it’s for pride or personal gain. As Gawande mentions, being a scientist does not have to be a career, but a mindset. By opening ourselves up to the reality in which we live and the truths that have been found, while remaining skeptical of the anecdotal and unproven, we all contribute to our collective human knowledge as well as a more positive future. Keeling, Charles D. “The Concentration and Isotopic Abundances of Carbon Dioxide in the Atmosphere.” Tellus 12.2 (1960): 200-03. IPCC (Intergovernmental Panel on Climate Change). 2013. Climate change 2013: The physical science basis. Working Group I contribution to the IPCC Fifth Assessment Report. Cambridge, United Kingdom: Cambridge University Press. IAP (June 2009). “Interacademy Panel (IAP) Member Academies Statement on Ocean Acidification”. , Secretariat: TWAS (the Academy of Sciences for the Developing World), Trieste, Italy. Challinor, Andrew J., et al. “Increased crop failure due to climate change: assessing adaptation options using models and socio-economic data for wheat in China.” Environmental Research Letters 5.3 (2010): 034012. Posted on May 30, 2017 Categories Ecology & Environment, Interesting, OpinionTags Atmosphere, Climate Change, CO2, Environment, Featured, Global Warming, Keeling Curve, Ozone, ScienceLeave a comment on Climate change, the Keeling Curve, and why you need to be your own scientist. Picture this. You’re grinding away at your lab bench or instrument workstation or computer (for those computational folks) for hours trying to come up with some usable data. You’ve spent the last few days trying new approaches to the same problem, to no avail. Maybe you’re sick with a cold. Maybe it’s late in the evening and you’re trying to get home. A notification pops up on your screen (we’re sticking with a digital scenario); you have your data – and, yet again, the experiment didn’t work or the results don’t make sense. This scenario is universal in all fields of science. All scientists can recall a point where hope was fleeting or simply nonexistent. Similarly, all scientists struggle daily with troubleshooting their experiments and equipment to get them working in the first place. Scientists, much of the time, bear the burden of these indelible realities of their craft in relative silence – only speaking of them in detail after their research has borne fruit. There is a lot at play that drives this. First – Science is expensive. Expensive enough that most scientists are not funding their own research. Instead, they get their funding through grants from government agencies, non-governmental organizations (NGOs), and for-profit organizations. In situations where research funding is on the line, researchers are under pressure to perform. The result is that they may not be as forthright about the lack of exciting positive results as if the atmosphere was more conducive to such communication. Second – Science is competitive. Whether we like it or not, the practice of science that produces positive results, in one field or another, comes with a certain degree of prestige or ‘bragging rights’, and while this competition can certainly give rise to innovation, it is not without its pitfalls. For example – Jonas Salk. Jonas Salk has gone down in the annals of scientific and public health history as the man who developed the first functional AND safe polio vaccines. Salk obviously wasn’t the only person attempting to develop a vaccine, his rival Albert Sabin was also making great strides, thus he was pressured by the weight of the prestige that would come with the vaccine’s discovery. Whether or not that pressure made his work go faster or not, we’ll never know, but I’d certainly be interested to know how quickly a vaccine could have been developed if the rival researchers could have had an open discourse about their ‘failed’ trials. It’s likely that, between the two of them, many approaches to the problem were repeated. Dr Jones Edward Salk, creator of Salk polio vaccine, at Copenhagen Airport. During four days stay in Kastrup airport CPH, Copenhagen Dr. Salk paid several visits to the Serum Institute, which was first one outside USA which created a polio vaccine. Dr. Salk also addressed the local Biological Society, 1959-05-28. So what exactly is the difference between a scientific failure and a negative result? A scientific study is conducted the formation and exploration of a hypothesis. For example, let’s say that the hypothesis of a particular drug study is that Drug X has some effect in treating a specific disease. In carrying out the study, the researchers find that Drug X has no significant effect in treating said disease. Is this a failure? Absolutely not. This is a negative result. Just because the result may not have been the desired result, does not mean it is a failure as there is still useful information to be gleaned from the study. Perhaps the molecular structure of the drug was not what was needed for the treatment to be successful. Perhaps the molecular structure was fine, but the method of drug delivery was lacking – rendering a potentially successful drug useless. There are so many questions that need to be addressed when negative results occur. Making negative results widely available to fellow researchers, instead of working them out on one’s own, perhaps only asking a few people for help, could potentially expedite the research process. What does actual failure in science look like? Look to the example of Andrew Wakefield publishing his fraudulent paper on the link between the MMR vaccination and incidence of autism in children in The Lancet. More here. The failure in this being the scientific malfeasance of manipulating data to obtain a desired result as well as the nondisclosure of conflicts of interest. Wakefield received funding to look for evidence on which arguments against the use of vaccines could be based. Nonetheless, science is an endeavor whose nature is largely trial and error (or negative results… or malfunctioning instruments) and it can be disheartening. The best case scenario is that, ultimately, the constitution of the scientist becomes a bulwark, holding fast against negative results. Stuart Firestein did an excellent segment on the topic on NPR’s Science Friday. EDIT: This was obviously supposed to post on March 17th. Personally, this is one of my favorite holidays. Cured meats, good beer, and stories of missionaries driving snakes (an obvious metaphor for Irish druidism) from Ireland – what more could you possibly want? In the spirit of the holiday, I’m going to showcase two interesting enzymes (or beerzymes as I whimsically and somewhat superfluously call them) that are necessary for the fermentation process of brewing beer – α(alpha) and β(beta) amylase [AM-uh-lace]. First – what’s an enzyme? An enzyme is specialized molecule, or protein, that biological systems use to perform certain functions. For example, in the process wherein our cells divide, the DNA housed inside our nuclei must be replicated for use in the “new” cell. This process requires the action of a DNA helicase, which is an enzyme that partially unravels the DNA double helix such that the cell’s replicative machinery can get in and do its job. Enzymes have many functions. The function of the class of enzymes known as amylases is to break down starch and glycogen, both of which are glucose polymers (molecules consisting of repeating units of glucose molecules), by hydrolyzing [HI-dro-LIZE] or “cutting” the chemical bonds that glucose polymers use to link glucose, the α1→4 glycosidic [GLY-co-SID-ick] bond. The human body naturally produces amylases for all sorts of purposes such as when α-amylase is secreted from the salivary glands to aid in the breakdown of starchy foods like rice and potatoes. Fun fact: amylases were the first class of enzymes to be discovered via the work of Anselme Payen in the early 1800s. So what do these enzymes do for beer? Well, the first step in the production of is creating a mash, or a sort of “tea” using mashed grains and hot water. Mashing grains releases starches into the water, becoming a mixture called the ‘wort’. Typically, many of these sugars released, at the beginning of the process, are not fermentable, meaning, they cannot be digested by yeast to produce alcohol. In order for these sugars to be fermentable, they need to be broken down into smaller constituents, the monosaccharide glucose and the disaccharide maltose. Once this is done, the yeast that is added to the wort can begin digesting the sugars, starting the process of fermentation. More information about carbohydrates here. Diagram showing the action sites of alpha and beta amylasae on a starch molecule. Courtesy of Wikibooks user Lrh. Not all amylases are the same, alpha and beta amylases perform similar but different jobs. Alpha amylases hydrolyze [HI-dro-LIZE] or “cut” glycosidic bonds in random areas along the glucose chain, eventually degrading the starch completely into individual glucose molecules. Beta amylases, however, can only hydrolyze every other glycosidic bond, forming maltose. At the end of the mashing period, the wort contains (from the alpha-amylase) and maltose (from the beta-amylase), two principal sugars used in fermentation. The wort will also contain a considerable amount of glucose-1-phosphate, a phosphate-linked sugar that is a product of the alpha-amylase function. Yeast cannot internalize glucose-1-phosphate, thus those glucose molecules are non-fermentable. This means that beta-amylase largely produces the greatest amount of fermentable sugars. Being that these two enzymes produce different, useful products, brew masters can manipulate their ratios of use their characteristics to their liking. The relative levels of the enzymes can be controlled by the temperature level of the mash as the two enzymes have differing optimal temperatures. Alpha-amylase functions at temperatures between 145° to 158° F, while beta-amylase operates between 131° and 149° F.2 Therefore, if you want to increase the amount of easily fermentable sugars, increasing the amount of alcohol in the final product as the yeast are able to consume more, you would want to mash your grains at temperatures optimal for the function of beta-amylase. If you want to maintain some of the sweetness of the sugar in your brew, you would run past the beta-amylase’s optimal temperature and mash within alpha-amylase’s optimal temperature range. Rejzek, M.; Stevenson, C. E.; Southard, A. M.; Stanley, D.; Denyer, K.; Smith, A. M.; Naldrett, M. J.; Lawson, D. M.; Field, R. A. (2011). “Chemical genetics and cereal starch metabolism: Structural basis of the non-covalent and covalent inhibition of barley β-amylase”. Molecular BioSystems. 7 (3): 718–730. Science is all about observation and contemplation. When you make an observation that the days of the year are becoming shorter as fall turns to winter and think to yourself, Huh – I wonder why that is, you are performing science. Granted, this isn’t the comprehensive, empirical method put forth by the likes of Francis Bacon, but it’s science in a philosophical sense. Why is the grass wet with dew in the morning? This process is human nature. It’s what separates us from lesser animals and it’s turned the gears of human ingenuity for thousands of years. We tirelessly ask these questions when we’re young with the constant inquisition of Why? Why? Why? Some of the most important foundational concepts in modern science were being explored in the years BCE (before common era). Foundations that we have since built upon to arrive where we are today. Today, scientists study phenomena like quantum entanglement and induced pluripotent stem cell therapies, but these observations would not have been possible without those that came before. Though mathematics are not a natural phenomenon in the tangible sense – though that may be debatable considering math is an abstraction of mental processes – they are crucial in the advancement of the sciences, so I feel that their inclusion here is appropriate. After all, could we have landed on the moon without a little math? Not even close. Some of the earliest instances of the use of mathematics are found in Ancient Egypt – as far back as 3,000 BCE. The area flanking the Nile River was subject to seasonal flooding, damaging property and homes. The Egyptians developed methods of geometric surveying, or “rope-stretching”, to define new land demarcations in which they could be free of the flooding. They used plumb-bobs, short cubit sticks, and ropes of 100 cubits in length. They developed the cubit as a unit of measurement based roughly on the length from the elbow to the tips of the fingers, roughly 0.5 meters (or 19.7 inches). Historical references attribute different lengths to the original cubit, so that’s a matter of contention. They also used 3-4-5 triangles as a way of finding 90o angles, an application of the Pythagorean Theorem, though the Egyptians are not credited with providing sufficient proof of the theorem to get full credit, essentially being “scooped” by the Greek math-wiz Pythagoras.1 (EDIT: Or at least I though they were. Edmark Law provided a more detailed account in the comments below.) This use of Pythagorean Triplets has also been reported to be used by ancient civilizations in China, India, and even Ancient Mesopotamia (modern-day Iraq). Thanks to modern advances in the health sciences, the expected longevity of human life has increased markedly in the past century. Thanks vaccines and public sanitation! Our knowledge of medicine is really a knowledge of how our bodies work and respond to harmful events and its development has been a natural progression as a result of how aware we are of our mortality and morbidity. We use that knowledge to develop interventions that prevent or halt the damage of events. Interventions like vaccines, medications, surgeries, and even radiation. As it was in the mathematics, many of these methods were developed thousands of years ago in many different parts of the world. outlining medical practice. A collection of papyri have been found that outline perspectives of medical approaches, the Edwin Smith Papyrus being the most well known for including only empirical, rational approaches to medical practice and leaving out much (not all) of the supernatural healing practices that were also practiced at that time.2 The papyrus largely outlines 48 cases of traumatic injury, including everything from examination to treatment (surgical, herbal, and a smattering of spells and incantations). As similar as many of these texts are, many containing mentions of herbalism (the root development in the production of medicine), no other region’s medical developments were as deeply affected by the influence of herbal remedies as they were in Ancient India. India’s record of medical knowledge dates back as far as 1000 BCE. In mentioning herbalism, let us not forget traditional Chinese medicine wherein herbal remedies are used commonly alongside acupuncture and massage. Astronomy, the study of celestial bodies (planets and stars) and events, is perhaps the cream of the crop when it comes to ‘popular science’, that is science that most people find fascinating. It tries to answer the question of, ‘where does it all come from?’ It’s impossibly large. It’s scenes of rocket ships blasting off, stars exploding, and black holes swallowing light itself. By and large, physics is required in the study of modern astronomy. But astronomy came first by thousands of years. Cuneiform tablet detailing the geometric tracking of Jupiter. This information eventually found its way to Ancient Greece where it was used, along with other principles, to further develop astronomy and, eventually, gave rise to more modern concepts in physics<sup>8</sup>. I saved one of my favorite subjects for last. Being from Wisconsin, a state known for its beer and cheese – microbiology plays a very important role in my daily life. Interestingly, it’s among the oldest sciences practiced in human history… by far. Granted, the practitioners didn’t know they were conducting science, but science nonetheless. In ethanol fermentation, microorganisms break down molecules of sugar and produce ethanol as a byproduct of metabolism. Thanks, microbes! The use of microbiology to craft fermented (alcoholic) beverages has roots in the Neolithic age, specifically, the 7<sup>th</sup> millennium (7000-6000 BCE), in China where evidence was found of fermented concoctions of rice, honey, and fruit. The use of this alcoholic beverage, as it was (and is) in many cultures, is of enormous cultural significance<sup>9</sup>. Evidence of fermentation used to produce alcohol has also been found in ancient civilizations in Georgia, Iran, Sudan, Babylon, and Egypt (thanks Wikipedia). Ethanol fermentation isn’t the only fermentation pathway, equally as useful is the lactic acid fermentation pathway. The sugar in the food that is going to be fermented is consumed by microorganisms and converted to lactic acid. The acid that is produced as a byproduct is what gives fermented products their bite and oftentimes is used to curdle dairy products. This method of fermentation is used to produce yogurt, cheeses, kimchi, saurkraut, and other cultured food products. It’s absolutely fascinating how the oldest science practiced in the world has gone largely unchanged for millennia. Paulson, J., Geoinformatics, F. P. T., & Paulson, J. F. (2005). Surveying in Ancient Egypt. Frey, E. F. (1984). The earliest medical texts. Clio medica (Amsterdam, Netherlands), 20(1-4), 79-90. Nunn, J. F. (2002). Ancient egyptian medicine. University of Oklahoma Press. Horstmanshoff, H. F., Stol, M., & Van Tilburg, C. R. (Eds.). (2004). Magic and rationality in ancient Near Eastern and Graeco-Roman medicine (Vol. 27). Brill. Wujastyk, D. (Ed.). (2003). The roots of ayurveda: Selections from Sanskrit medical writings. Penguin. Hanson, A. E. (2006). Hippocrates: The” greek miracle. Medicine. Ossendrijver, M. (2016). Ancient Babylonian astronomers calculated Jupiter’s position from the area under a time-velocity graph. Science, 351(6272), 482-484. Jones, A. (1991). The adaptation of Babylonian methods in Greek numerical astronomy. Isis, 82(3), 440-453. McGovern, P. E., Zhang, J., Tang, J., Zhang, Z., Hall, G. R., Moreau, R. A., … & Cheng, G. (2004). Fermented beverages of pre-and proto-historic China. Proceedings of the National Academy of Sciences of the United States of America, 101(51), 17593-17598.